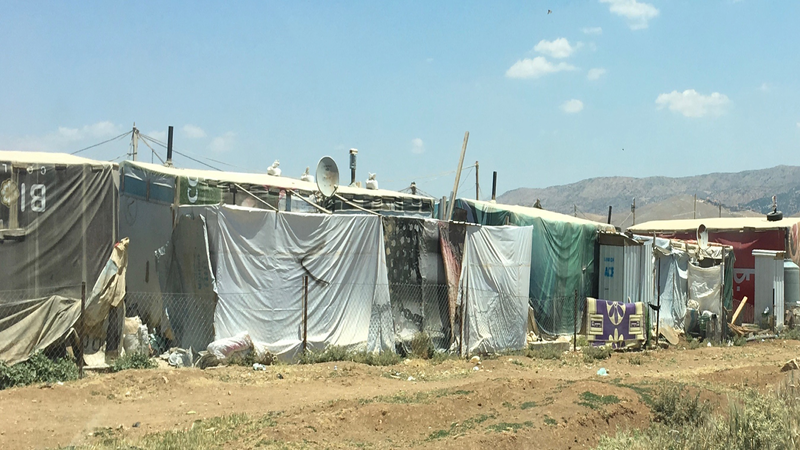 These are the tents where many displaced Muslim women and children are forced to live because of war throughout Iraq and Syria. I saw first hand the many families who have been denied entry into the U.S.A. for safe haven and refuge. The majority of these families were made up of vulnerable women and children who lacked food, water, and adequate health care. This past summer I had the honor of traveling in the Middle East in areas and locations I am not permitted to share publically. I worked with, taught, and trained Christian leaders who came from many war torn areas due to fighting of ISIL/ISIS and other rebel groups. There, near the border we learned together, trained together, and prayed together. It was an experience I will never forget. Ananias House seeks to preserve the New Testament heritage in the Middle East and North Africa. Just as Paul was sent from Damascus into the world, the people of Ananias House rise above war and persecution to grow the body of Christ in their region. While I would love to share pictures and faces, I am unable to do so because of the danger it would cause those I was able to train and minister to. The account of my trip from…Ananias House Ministries. As a young Christian, I read many books, articles, and blogs about Christian martyrs. Their passion and dedication left me speechless and motivated. Their struggle and dedication were hard for me to identify with because I didn’t walk where they walked or live where they lived. Nonetheless, these books and articles bridged a gap in my understanding of their faith and dedication. Little did I know that 15 years later I would have the honor and joy of serving and walking beside persecuted Christians. This opportunity came for me in the summer of 2017. I took part in Ananias House training sessions about learning to read the Scriptures, as well as teaching an independent course on Colossians. Along with this opportunity, I witnessed the work of a brave couple ministering on the frontlines near the Syrian border. Their work was dedicated to reaching MBB’s (Muslim Background Believers). What follows is a snapshot of my time working with Christian brothers and sisters whose passion for Jesus and multiplying the church are unmatched. When I first met with those who came for the training, I was struck with their disposition toward what they were living through each day. Nothing in them glorified their ordeal, and they made no spectacle about their faith and passion for Jesus. They were simple people. They loved Jesus, loved people, loved their enemies, and wanted to spread the fame of Jesus. I came to the realization that I elevated them much higher than they would elevate themselves. One of our training areas where we explored the book of Colossians together and how its truth can equip us as leaders, church planters, and evangelists in war torn regions. Along with their humility was their pure joy. These were men and women who were facing difficulty and trial each day as they lived and ministered throughout Syria. They were facing extreme danger and struggle, but you would never know it. These men and women were filled with a joy I had never seen or experienced. I spoke with one man whose car he was driving was hit with, as he put it, “a rain shower of bullets.” Miraculously not one bullet touched him, and the terrorists continued on. After telling me this story I was speechless, but him? He began to laugh! With a smile from ear to ear he said, “Those terrorists make it hard to love them sometimes, but I do. I love them.” This man had joy that he was spared, as well as love in his heart for those who tried to kill him. I quickly realized that my time with these beautiful individuals was less about the teaching and training, and more about the mutual love and encouragement we would share in our time together. After each training session, we would usually have tea and food, and not once did I see a frown. Not once did I hear fear, negativity, or worry. I heard constant encouragement and thanksgiving to Christ for what He is doing in their land. In many of these conversations I was the one being encouraged! I had expectations of working with people who were sad, downtrodden, and in desperate need of encouragement. And while some of that may be true, their joy, love, and humility far exceeded anything I have ever seen or been around. One of the older ladies (who had more energy than my 32-year-old self) shared her story with me. With a large smile she explained the work she is doing in her village, a place that terrorists were trying to take over. She stood up to the attackers and refused to leave. Many others left for fear of their lives. Many pastors and trained leaders left, but again, she did not. She explained to me how she preaches each Sunday, leads the village’s children’s ministry, and organizes songs and worship music. She does all of this ministry, and prays daily for the raising up of more leaders. Everything Ananias House put together for these leaders, from printed materials, to travel arrangements, to lodging, was flawless. They were above excellent in their work and are playing a role in the Middle East that is touching more people than I could ever imagine. They are an active presence in bringing the Gospel of hope, love, and peace to this desperate region. Following our time of training, I transitioned to meet with a beautiful couple who are doing work with MBB’s. They minister in many refugee camps and do the pure work of ministry as seen in the New Testament. Like the analogy of a farmer in Mark 4:26-29, they engage new fields, work hard in planting the seeds of the Gospel, nurture new growth through discipleship, and put the sickle to the harvest and plant churches within the camps. Their heart is like Paul’s in Romans 15:23: to serve until there is no place left to minister. They do not seek recognition, nor do they seek to spread a church brand, or become popular. They are nameless people who exude humility and courage. They love and serve Syrian refugees with no strings attached. I did not do any work with them per se other than meet with them, learn from them, and encourage them. Little did they know that their ministry to me in my short time with them was more than anything I could ever hope to return. In fact, that was the theme of my time with these persecuted Syrian believers. I went with the expectation of giving and serving until I had nothing left. I quickly realized that by talking with them and hearing their stories, I was learning more than I ever could have hoped to impart. I am forever in debt to each of these precious Christ followers for the love, joy, and courage they displayed to me. I encourage all who read this to pray for Ananias House and the work they are doing. Pray about serving, partnering, and supporting them financially. They are truly pioneers on the frontlines doing the work of the Gospel. An aerial shot of the “concrete jungle” where many Christians fly into. From this centralized location many depart into different regions of the Middle East for ministry purposes. In summary, here are 5 key points I learned and experienced while with my Syrian brothers and sisters. 1 – The Gospel is simple. Living the Gospel is costly. These individuals have counted the cost and their courageous example beckons all Christians to rethink what it means to be a disciple of Jesus. 2 – Jesus is at work in powerful ways through the simple obedience of His people. The same power of God that we read about in the Scriptures is at work in the neighborhoods, villages, and camps throughout Syria and neighboring countries. 3 – Christian work should be intentional and urgent. These followers of Jesus display a radical passion to extend the fame and glory of Christ through evangelism, discipleship, and church planting. 4 – Evangelism and Church Planting will win the lost for Christ. These Believers understand that large churches, slick sermons, and charisma will not change their nation, nor turn the hearts of their enemies. It requires what Jesus originally sent us to do: go, share the gospel, and make disciples. 5 – Although the West tries to present Islam as a peaceful religion, this is not always the reality. We must meet the violence with love and pray for the salvation of Muslims. While learning from those on the frontlines, I was made vividly aware of the evil and ideological hatefulness they face. We must pray for the triumph of the Church and that Muslims would come to know the saving hope and grace of Jesus Christ. May the Lord continue to strengthen and multiply the churches in Syria to the praise of His glory. Pray for the persecuted church around the world. Pray for many of the beautiful Muslim and non-believing Arabs in this region who are caught up in the pain and torture of war. Pray for the soldiers of ISIL/ISIS as well as other rebel groups. That peace would come and their passion for violence, death, and an Islamic caliphate would cease. Visit Ananias House and prayerfully consider partnering with their efforts. I witnessed first hand where 100% of their resources are going. Visit their website here and their Facebook page here. Lastly, please share this post as this will help spread the courage and passion they so bravely display for Jesus Christ. Their stories are more than worthy to be shared and heard. This entry was posted in Church Planting, Evangelism, Scripture and tagged Colossians, Middle East, Persecuted Church, Stories on September 15, 2017 by Noah D. Schumacher.